So many of us look forward to getting the couple of weeks off so we can vacate over seas or go somewhere where we can relax. But we don’t have to wait for that vacation. We can sculpt the perfect getaway in our heads. Work on creating the perfect place in your head where it is tranquil and peaceful. Have a room that overlooks the ocean. With tranquil paint colors on the wall. Your favorite furniture to relax on and scents that put your mind at ease. Literally imagine your head blowing steam out of it. It is a calming mental picture that can allow us to release trapped energy that is causing us to be anxious our uptight. A book called Pscyhocybernetics talks about how the author was in a national park in which a geyser blows water through the earth every hour or so. The author likened the eruption to the earth needing to blow off steam and relieve stress. And it does this by erupting water 100 feet into the air every hour or so. He created an image in his head of him blowing off steam so to say through his skull. To where all the stress shot out of his head in the form of steam. It is a good mental exercise to calm ourselves and feel lighter about the things that are causing us stress. Take a mental note over everywhere you are holding stress in your body. Simply relax those areas. You can also do a quick scan starting at the tips of your toes and ending at the top of your head. Or vice versa. As you are working your way through your body, relax every section as you go up or down with your awareness. This will allow you to release tension in spots that you may have not even know you were holding. The best part about it is that it only takes a minute or so to complete an entire scan of your body. And it can be done before things like meetings, dates or any event that my bring you any level of anxiety or tension. There was an experiment done by Ivan Pavlov who was a Russian psychologist in in the late 1800’s. He test the salivation response of a dog by ringing a bell every time he placed a meal in front of it. After a while, Pavlov observed that even when the food wasn’t present but the bell rang, the dog would still salivate. We as humans do the same thing. We have conditioned responses to things and situations that when similar situations or scenarios occur, we act accordingly. But the fact of the matter is that we don’t need to react this way. We are the masters of our own emotions and seeing as we conditioned ourselves to act one way, we can condition ourselves to act another way. In a way that is more conducive to us being calm. So next time a situation arises that usually causes you anxiety, simply consciously override the automatic response pattern that would normally ensue. Break this pattern with a positive and calm reaction instead. Do this enough and you will literally condition yourself to respond calmly to situations that used to cause you distress and anxiety. When we are babies, we know how to breathe properly. Have you ever seen a baby lying on it’s back and fast asleep? It’s belly rises up and down with ease right? Well as we grow older, we start to use secondary muscles to breathe. Muscles that are meant to assist our breathing but not be the prime muscles that help us breathe. We start chest breathing which is more rapid and takes more energy. It also keeps us from taking in as much oxygen as we could if we were using our diaphragm through the likes of belly breathing. We can calm ourselves but reminding ourselves to breath using our stomach. Draw air into through your nose while gently pushing your stomach outwards. Then letting it flatten out naturally. Repeat this until you feel more calm. Doing this will give our cells more oxygen and will let us feel more calm and think more clear. Our whole body functions better when it has the optimal amount of oxygen flowing through it. The more you do this, the more naturally you will do so without thinking about it. It is the way our body knows how to breath best. It just sometimes needs to be reminded in order to start doing so again. Stress.org talks about how by doing 20-30 minutes of belly breathing a day will reduce anxiety and stress as it stimulates the parasympathetic nervous system which brings about a calm state in us. It also will shift your awareness away from what we are worry about and allow us to focus on our breath which will help us quiet our mind. Deep breathing can also be beneficial for better metabolism, lower resting heart beat and decreasing blood pressure. We have all thought thoughts at times that were what we think can happen if the worse case scenarios ensues. We may even do this daily over events. Almost every single time we do this, the worse case scenario that we play in our minds doesn’t happen. But the fact of the matter is that we are reacting emotionally to all these negative scenarios we are playing over and over in our head. In order to be calm, you and I need to realize that these scenarios are not real. Remember that the mind doesn’t know a real thought from one we make up in our minds. So is true about our emotional response to our thoughts. We must only react to what is here and now. Don’t give these negative scenarios power. They are just your mind trying to take you to the negative. Simply react as life comes to you. And don’t give too much or any power for that matter to these negative thoughts. Also, ask yourself what is the absolute worst thing that can happen. Confront your fears and anxieties head on with this question. Often times you can calm yourself down by realizing how silly that answer is when you ask that question and get the answer. If it is a terrible answer that you get back, then at least you faced your anxiety and are more in control over it than before asking this question. Asking yourself the question “Is this life or death?” or again what is the worst thing can happen. We most likely won’t die which is our deepest fear. It stems from long ago where our primitive ancestors may die if they didn’t make the right decision or do something correctly. But we still bring that fear into things like interviews or dates. By confronting these fears and asking what the worst thing can happen would be, you see it as you simply being in the same place you were before. If you don’t do good in the interview, you are still jobless and simply need to secure another interview. But also ask what the best thing is that can happen. You secure a new job after crushing the interview or you go on a date and end up falling in love. You are either going to be right where you were before, or you will be way ahead. There is only good things that come out of it. You learn from it or you win. Ask these questions a few times to yourself before you go into stressful situations and your stress will end up dissipating or drastically lessening. One of the best quotes of all time in my opinion. We can find peace in the moment. When our thoughts are neither here nor there. When we meditate it is like the ocean calming after a big storm. The waves start thrashing and it almost becomes lake like. The same is true with our mind. Thoughts are running rampant. But when we meditate, we allow those thoughts to quiet down and we experience a nice silence in our mind. The best thing about mediation is that you can literally do it anywhere. When you find yourself stressed and wanting to be calm, simply become aware of your breath. This will put you back in the moment and calm your mind and body. Often times we create anxiety in ourselves because we are so overwhelmed with how much we have to do. But in order to stay calm, we must simply see things as a process where we put one foot in front of the other. Brick by brick. When we look at it this way, we see things as more manageable and we get a feeling of control which brings more peace of mind. Progress is still progress even if it is through baby steps. And baby steps all add up. Simplicity allows us to be calm as we are don’t have to get caught up in the intricacy’s of things. Keep things as simple as possible. Simplicity equates to a less stressful existence. When we are burning the candle at both ends and trying to fit everything into our schedule, we wait until the last minute to do things. This leaves us feeling rushed and crunched for time. No matter what you are doing, leave yourself 10 extra minutes to show up early. Worst case you will hit traffic and end up being right on time. But most of the time you will arrive earlier than everyone else and have time to get your mind right for the meeting or event you are going into. This is time where you can do a quick ten minute mediation or work on visualizing your goals coming true. Do things during that gap that will prime your mind for positivity and hope for a better future. Even turn on a motivational video for these ten minutes to get you amped for what you have to do next. I was taught this technique by a holistic doctor. It elicits an almost immediate relaxation response. Try doing so by rubbing the tip of your tongue on the part of the roof of your mouth where the tip of your tongue usually rests. Rub it in a circular motion until you yawn once. That will indicate that you have triggered your relaxation response and you will immediately feel more calm. 1.) Pressing our tongue briefly against to soft spot on the roof of our mouth to where there is tension in our tongue. Then allow your tongue to relax. Do this with your eyes closed and mouth hanging slightly. 2.) Exhale and feel your tongue relax even more by exaggerating the relaxation. Keep exaggerating this relaxation response until your tongue is doing what it will, thickening or shortening. Don’t judge it, just allow it to relax. Put the tip of your tongue on the soft spot right behind your teeth. Draw air in through your nose while counting to 4. Hold your breath in for a count of 7. Release the air through your mouth by pushing it out so that you make a whooshing sound when it comes out. Repeat this process 3 to 4 times until you feel more relaxed then proceed with natural breathing. This allows us to stop ourselves from engaging in a pattern of shallow breathing. It starts to work out the carbon dioxide that is stuck in our tissues which is a symptom of shallow breathing. Which contributes to long term oxidative stress. I can’t tell you how much time I have saved doing this and better yet how much stress I have eliminated. I would be stressed getting off of work knowing I have to cook and still get other things done. When you prep your meals, you not only will save time that you can use to either go to bed at a good time or simply better manage your time. But it also allows you to stay on a good eating regimen that can help with weight loss or muscle gaining goals. There will be no hidden calories as there often is when you go out to eat. You can do this for the entire family if you have one. Make a fun day out of if where you BBQ your meat for the next few day and prep your rice, vegetables and fruits. That way you can come home to meals you just need to warm up. Instead of having to think about what you are going to cook and then cook it. Game changer right here! Whenever something comes up that you can’t that affects your mentally, emotionally or spiritually, give yourself a time limit on how long you will dwell on it. When that time is up, move on and leave it in the past. Allow yourself to process that emotion, but don’t stay there too long. If need be, even set a timer and once that timer dings you let yourself off the hook from dwelling and move onto something productive. This will be more of a healthy way to process what is going on in your life without suppressing it. But not stay there too long to where we become victims over our situations. Also learn to say YES actually say it to your feelings of anxiety. We subconsciously are saying NO to everything in our body that we don’t want. But we can consciously say YES to it and often times these feelings will dissipate or release out of our body. This will also give yourself permission to be stressed or anxious as a lot of us keep denying and denying our stress in hopes that it will disappear if we don’t acknowledge it. But acknowledging it will allow us to process it in a more healthy way and get past it faster than denying it. Often times we simply need a distraction to get us away from overthinking things or getting trapped in our anxious feelings. Music can transport us into a another time or listen to another person’s story. Often times we can relate to the lyrics and have a feeling that we aren’t going at this life alone. But there is science to this tip. A great article titled “Releasing stress through the power of music” talks about how music beats around 60 heats per minute. Which can cause our brains to synchronize with the beat and actually cause alpha brainwaves. These are the exact brain waves that are present when people are in an induced state of sleep. The article talks about how researchers at Stanford found that listening to music seems to allow a change in brain functioning that in comparative to medication. I don’t know what it is but many times I have felt stressed and naturally I just gravitate towards getting a shower in. It feels safe inside the shower and allows my anxiety to pass or at least lessen and allow me to become more calm. It is a great way to allow tense muscles to relax as the water washes down our bodies. Along with nurse injuries by increasing blood flow to them through the hot water. Allowing our body to start healing. Another site about reducing stress with showers talks about how the scents in shampoos are almost like aroma therapy which can drop your levels of stress in a big way. It releases feel good hormones in our brains when we smell pleasant scents. It also suggests that when buying shampoos, purchase scents that will allow you to feel more relaxed so when you become stressed and jump in the shower, you will be set up for success to calm your worries! Often times there are so many darn thoughts bouncing around our heads that we simply would benefit from writing them out and getting them on paper. Psychology Today talks about how there is no better way to learn about our thought processes more than through the act of writing it down. Write it like a grocery list – Similar to writing out what we need at the grocery store, we can writ out what we need in order to stay mentally healthy. Things like taking naps, binge watching shows or reading a good book. Also list out all the things you need to get done throughout the week. This will allow you to get all the thing out of your head that you need to do for you this week that will help you feel more productive. This will lower stress as it will all be in front of you and not lost in your mind, bringing more calmness to your life. Journal a letter – Write a letter to someone in the form of what you would say to them if you were going to vent or talk about your anxiety, then throw it away or burn it! Write A Story About Your Anxiety Monster – See your anxiety as a monster with a weak point to where you battle it and win through exploiting it’s weakness. Imagine Your Favorite Superhero Has The Same Problem – How would your favorite superhero or fictional character solve your problem. Imagine how they would react and act like them. Become your own favorite superhero. There are so many benefits of working out that can literally alter your existence on this earth. But it helps with anxiety directly and indirectly. During workouts you will release endorphins and boost levels of dopamine and serotonin. Doing so will cause you to feel better, more calm and more able to handle your day. It also makes you more fit which will cause you to feel less anxiety over your personal image along with allow you to be more efficient as you will be in better shape. When we are in better shape we aren’t bogged down by the mental fog that comes from being unhealthy. A recipe for a calm and productive life! Coloring isn’t just for kids! Research has shown that it can help relieve stress in adults. An article by Everydayhealth.com references an MD named Chris Aiken, who talks about how one way to look at mental health is to be fully present along with being absorbed completely and fully engaged in what we are doing in the present moment. Coloring allows you to be fully present and focus on what is happening moment to moment which allows us to push fears out of our mind and set our anxieties aside. Hence cause us to feel more calm. The article also talks about how coloring causes us to get into a rhythmic flow that is similar to mindful meditation. This is done by being aware of the physical sensations in your hand of the pen touching the paper. Along with feeling the pencil in our hands and moving it in different ways as we work our way through coloring the picture. So harness the power of this childhood escape and do so in adulthood, have no shame! Increasing levels of GABA which is a neurotransmitter that helps the body relax. Reduces stress hormones by inhibiting the release of things like excess cortisol which in high levels leads to stress and mental disorders. Acts as an anti-inflammatory which chronic inflammation can lead to diseases, disorders and of course chronic anxiety. Balances your blood sugar which when blood sugar levels are low, we can become anxious. It will also help you sleep like a baby, allowing you to wake up more calm and refreshed. Putting you in a better mental state to take on your day. When it comes down to it, we all have some levels of worrying when it comes to health in our later years. So the best thing you can do is take a preventative mindset about your health to ease any worries about getting any diseases or disorders later on in life. By taking a preventative approach now, we can make sure we don’t become sick later on. Taking a preventative approach to life can consist of working out and eating healthy, supplementing, doing health screenings, educating yourself about health trends and what is good for you and what is not, meditation, yoga and self care activities. You can also become aware of things that run in your family history and how to take preventative measure to make sure they don’t affect you. Both physically and mentally. Along with taking measures to eliminating bad habits like smoking or stopping drinking. By living your life in a way where you are thinking prevention at all times, you will make choices that will put your mind at ease that you are making the right choices to where you will live a long and healthy life. And won’t be plagued by things that will affect your quality of life. Doing this can put our minds at ease and bring more of a sense of calmness to our daily lives. Often times we will get half of a project done and then for the rest of the day worry about how we still need to get it done. This causes us to not be able to be present in other things we need to get done or bring a level of creativity we need to bring to life itself in order to be as productive and happy as possible. Knock out one task at a time. Not matter how long it takes you. Then move onto the next. This will allow you to get more done and be more efficient in your actions with these tasks. Between me and you, this tip literally changed my life and caused more calmness in my mind and body. The life we have has a lot to do directly with our mindset and how we react to it. In order to put yourself at ease, just know that this will pass. It may last a day, a week or a month or even longer. But it will pass. Keep letting yourself know that and it will bring more calmness to your life. More so than if you were overtaken by anxiety and thinking your are going to be stuck in it for ever. Literally see you as being a massive figure that is towering over your anxiety in your head. See yourself literally looking down on it and realizing how small it is and almost laughing at it and the fact that you used to see it as bigger than you. Then step on it and crush it. This will allow you to feel better. 27.) Use Anxiety To Your Benefit! Also, use the hell out of your anxiety and tension. A good tip is to look at it as if your fear or anxiety is actually excitement. It is just manifesting itself as fear because your are allowing it to flow that way. But instead see your anxiety is excitement and channel that energy into something. Often times I will get anxious and instead of isolating myself, I will work hard on projects or go for a workout. We can’t be calm all the time, so why not use anxiety energy. After all, when we are anxious we are often times experiencing high levels of energy. So if you can, use it to do something productive. This will show yourself that you can triumph over these feels of anxiety. Beating your own demons and monsters into submission. One of the cure all’s to feeling anxious and overwhelmed is to have big goals and look at them often. Write them down daily to keep the hope in your mind.This will permeate through your body daily and allow you to have a big vision for the future. When you and I don’t have big goals, we drift around. We can have all this potential but if we aren’t using it, then we are just a 747 with no route to follow or captain to fly it. When we have big goals for multiple areas of our lives, we have hope for a better future along with feeling more at ease that we are moving forward. Progress equals happiness. It really isn’t even about the goal, it is about who we become in the process. I didn’t even really believe in this at first. I thought it was corny. But it is 100 percent true. So have big goals and you will be more calm. Your anxiety will be seen as excitement instead now when you have goals. You will more forward more calmly, happily and excited! A great article titled “why cleaning makes come people feel less anxious” talks about how coming home to a clean home can have a soothing affect on us. Even after a long day. It also talks about how even when we do things like clean the kitchen floor, we are putting ourselves in almost a meditative state to where cleaning up can be therapeutic. The article quotes Darby Saxbe who is an assistant professor of psychology at the University of Southern California. “Cleaning gives people a sense of master and control over their environment.” She also goes onto say that life is so packed with uncertainty and we have the feeling and knowing that many situations are out of our hands. Seeing this is the case, we can at least assert ourselves in the space that we live in. The psychology behind this concept can also be linked to an evolutionary effect. An evolutionary anthropologist at Masaryk University talks about how we like to predict things as humans as it allows us to better survive in this world and know what resources we can extract for our immediate environment. I know for myself that I cannot start doing any of my work until all my space is clean. For some reason I just tense up until everything is in place. Call this OCD, ADHD any acronym. I feel way more calm when my place is clean. Not spotless, just well kept. I will quote T. Har Veker now to make my last point! When it comes down to it, if we aren’t clean in our homes, we won’t be in our cars, we won’t be at work. We won’t be in our relationships. Our actions bleed into every area of our life. We can do great in one realm and slack off in another. It just doesn’t work that way unfortunately. Once you clean your space, your head space will become clear. It will translate to other areas of your life being clean. Both physically and metaphorically speaking. You will become more calm as everything in your life is more put together and in place. Putting us in control of our mental health for free. Research has shown to bring complete or partial relief in 80 percent of cases and can be permanent. This was researched by the founder of EFT Gary Craig. It treats the underlying cause instead of masking symptoms. Tapping is easy to learn as you will see in the video below. At the end of the day, even though it may seem a bit new age, it is just a way to clear stuck energy out of your body. See it as that. We are all made up of energy and sometimes energy can get blocked. Once we clear it, the vessel that we call the human body can relax and get back to homeostasis. Here is a great video for tapping for anxiety that you can use! I was dating someone a few years back and had a panic attack. She told me to sit down and tap my knees. For some reason, I don’t know why, but it worked to calm me down and has worked like a miracle ever since. Try it, I hope it works for you too. Ok this is just a joke, but for real our heads can actually not be on straight and cause a myriad of physical, mental and emotionally unpleasant symptoms. THe C1 vertebrae is the bone that holds our head up, also known as the atlas. When our C1 vertebrae is off, our heads can have a slight tilt. It can cause jaw problems, headaches, depression, anxiety, brain fog and more. When it is properly in line, the rest of our spine tends to follow suit. Everything become aligned and we become more calm. Our body functions more optimally. We are able to breathe better, see better, have less bodily tension. Hence being happier functioning humans! Book an appointment with someone who specializes in Atlas adjustments. Usually they will do an X-Ray first to see who type of subluxation you have. Then adjust off that image. Unlike regular chiropractors who adjust based off of what they feel. This is more scientific and way more effective. And usually they only have you come back a few times versus multiple times per week. This can be a great activity to do before you go into any stressful situation. We all hold tension but sometimes it is hard to identify where that tension is being held. So instead of indentifying it, just tense up your whole body and hold it for a few seconds then release your whole body. Do this a few times and you will notice yourself being way more relaxed throughout your entire body. You can also hit major spots where we hold tension like the jaw, shoulders, shoulder blades and forehead. Simply consciously working on relaxing this trigger points can help you bring calmness to your entire body. When it comes down to it we start with a bad thought about an outcome or multiple outcomes in the near future. One thought becomes two and two become four. They multiply about these situations that we are stressed about. Each time we make them more vivid about the things that can go wrong. Adding different colors and hues to them. But instead, next time your catch yourself doing so, switch it up. Dwell only on the positive aspects that can happen. Envision the best darn scenarios that could come out of the thing your anxious about. Then add colors and hues to those pictures. Creating a beautiful portrait of the perfect scenario that you would like to come out of what you are anxious about. It is all about priming the brain for success. And we have primed ourselves to always go to the negative. We can start priming ourselves to go to the positive simply by overriding our subconscious tendencies. We do this by envision the positive things that can happen as soon as we start to go to the negative. We can literally do this with any emotion we choose. Take worrying for example. We have taught ourselves to habitually worry about things. When we try to stop worrying, we resist and it continues to overtake us. To stop this habit, we need to right away, replace a worrying thought with a positive thought. Continue to do this and worrying will lessen or disappear altogether. 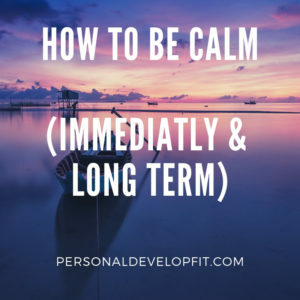 In order to switch on our calm switch in general or during when we are feeling anxious or stressed, think of a time where you were totally chill. Not a worry in the world. For all intents and purposes, completely calm and tranquil. Remember how you felt, what sounds were present and how your body position was. Once you remember this, simply feel that way not. Replay this picture over in your head and embody the feelings you felt at that time. Do this a couple times when you are anxious or when you are going into a stressful situation. You will calm yourself down and be ready to take on whatever situation with more ease and tranquility. So there you are my friends. 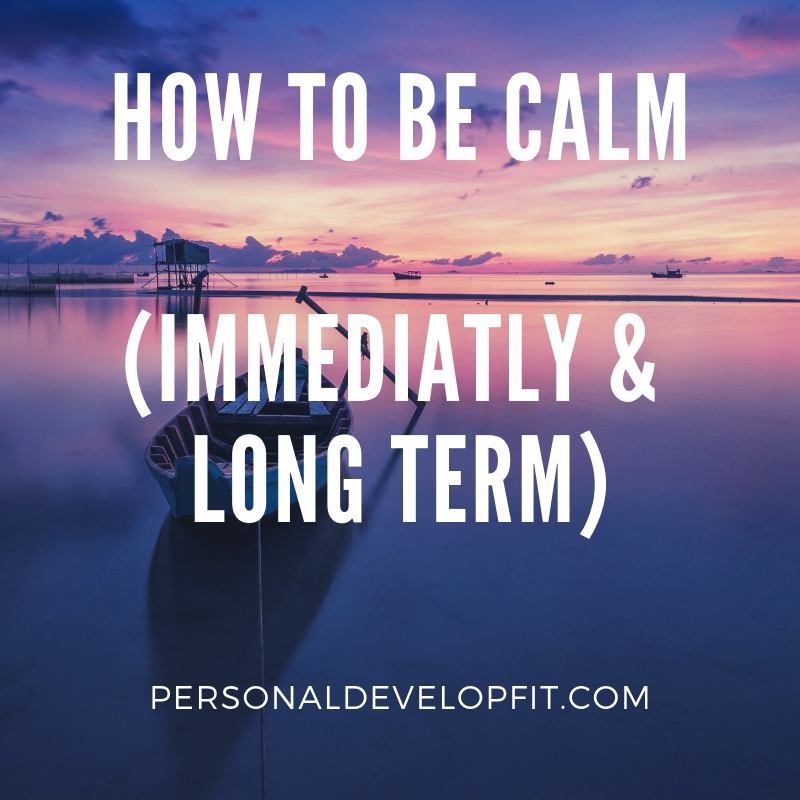 33 tips for how to be calm and less anxious in this life! I know it is a big list, but I think it can provide value to you both in the short term and in the long run. I hope you enjoyed it and would love to hear what you thought about it and if you have anything to add that has really helped you calm down! Much love my good friends! Also, below are quotes on being calm that can help you ease the tension!